Classy and awarded Single Malt Irishman. In Ireland, Egan means business. The Egan family have been making Whiskey since the 1800s and the current rivers of Spirit are made by the sixth generation. 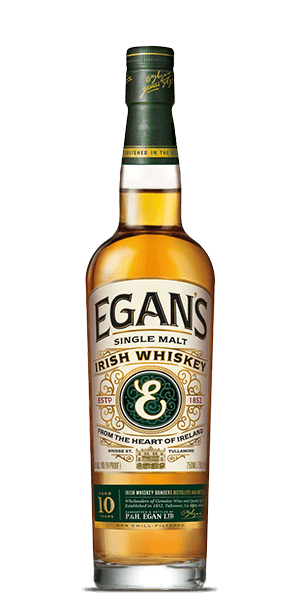 Patrick J. Egan, a benevolent and workaholic founder of the Egan distillery, once said the Irish people should not consume English and Scotch beverages if there's great Irish booze to be enjoyed. The company went under in the Sixties, but in 2013, the descendants resurrected the brand as a bottling company and launched their first expression the following year. Their 10-year-old Single Malt is the first bottling to bear the Egan name in the modern era and it's an amber delicacy worthy of its heritage. Named Best Irish Single Malt Whiskey at New York International Spirits Competition in 2015, it's a creamy and complex Spirit matured in ex-Bourbon casks. The lovely booze made from 100% malted barley comes from an undisclosed distillery, but most aficionados believe it originates from Cooley. It's a rich and viscous Whiskey with a classic lead aftertaste of pot-still Whiskey and is quite earthy for an Irishman. It's perfect for quiet moments after dinner and is surely one of the best Irish Single Malts with interesting complexity and a good story behind it. What does Egan's 10 Year Old taste like? The Flavour Spiral™ shows the most common flavours that you'll taste in Egan's 10 Year Old and gives you a chance to have a taste of it before actually tasting it. Aromas of pineapple, coconut, ginger snaps, baked apples and vanilla on the nose. Medium bodied with fruity flavors of red apples, pineapple, banana and mango, bringing oaky spiciness towards the finish. Coconut, vanilla and ginger with oak notes. Very smooth. The flavors start out subtle, but then really kick in at the finish. I will definitely be buying this again. Dont know much about whiskey yet, but I enjoyed it tremendously.